The new site for this AI enterprise company exudes radical efficiency with a crisp technical look and wit-infused copywriting. 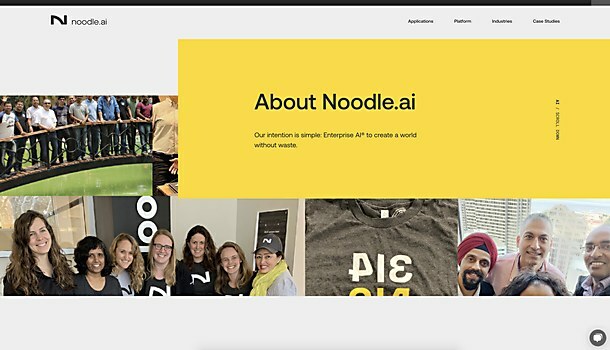 Highlights: The rebrand includes a strong new logo in the form of a bold N monogram, which can also be read as AI, a modern typography system and a color palette inspired by the industrial workplace that balances a crisp technical look with math and wit-infused copywriting suited to Noodle.ai’s company culture. We took it one step further and also created a set of custom glyphs or “mathabet” that became part of the visual identity and loading animations for the website. Challenges: Making the complex technology simple to understand, while not shying away from the complicated answer. The website’s audience varies greatly in their understanding of the subject matter. We worked hard to find the right balance of not making the information too watered-down or overly detailed. 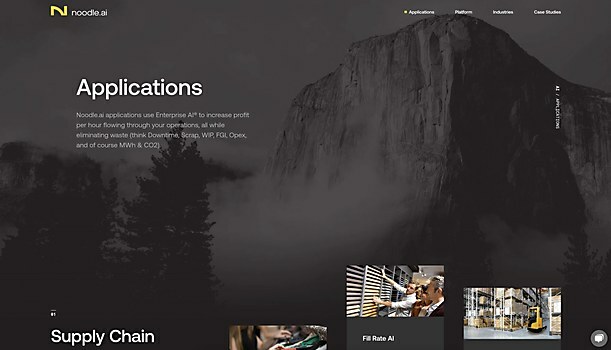 Favorite details: One of the main goals of the website was to educate potential clients about industrial AI. With simple navigation and interactive infographics, users can determine whether AI is right for them and be directed to Noodle’s human help team. As a fun touch nodding to Noodle’s playful internal culture, we included a “translator” button that allows users to decide whether they’d prefer a “normal” explanation of industrial AI, a “PhD”-level description or “robot” (binary code). 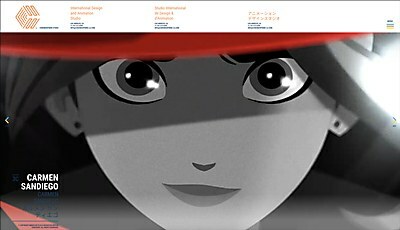 Time constraints: Time is always a challenge, but the close collaboration between Ueno and Noodle worked to our benefit. 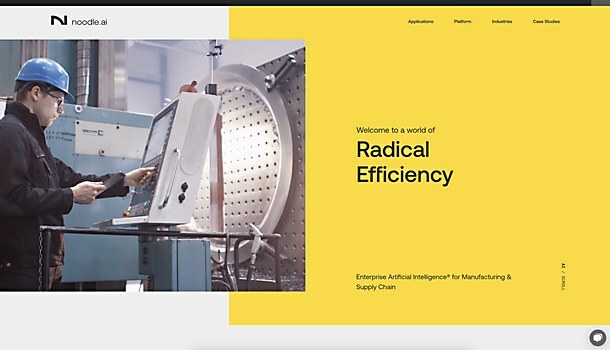 Through the branding and site architecture phases, we were able to better understand Noodle.ai’s unique product offering and establish a point-of-view on how to explain it that aligned with their business goals. Anything new: We created a firm foundation during the content strategy and site architecture phases of the project. Since this was the first application of the new brand, we did not focus on polishing pages as we designed. Instead, our focus was to create a first pass at all the pages, which helped us quickly identity system level components and determine what design styles worked. Designing everything at once sounds crazy, but was actually super helpful. The ability to see the whole design system gives you important insight to make decisions, and it enables you to spend time on the moments and sections that matter the most. 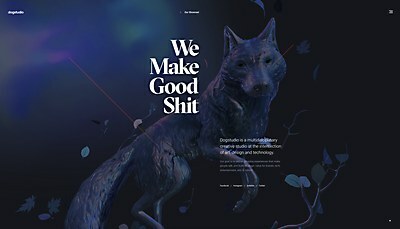 Dogstudio’s 3-D dog warmly wags its tail at users as they explore the latest iteration of this multidisciplinary creative studio’s site. 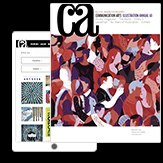 Inspired by the design of the 1972 Munich Olympics, Chromosphere’s new site showcases its in-depth development of visual ideas. This digital platform for Netflix nature documentary Our Planet inspires users to dive deep into our natural world.